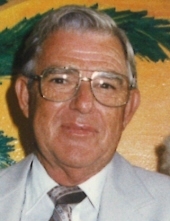 Jimmie Ben Campbell, 93, 0f Charleston, loving husband, dad, and pawpaw, left this world, April 4, 2019, to begin his new quest. Jim was born to, Hugh Campbell, and Maude Dorsey Campbell on February 5, 1926. In addition to his parents, Jim was preceded in death by his wife, Pansy Layne Campbell; sisters; Beulah Giles, Maureen Luckey, Ann Hughes and Mary Robinson; brothers, Hugh, Cecil and Lee Campbell. Jim entered the military for WWII, and while home on leave had a car wreck, broke his back and was rehabilitated by captured German doctors, at Anderson Hospital, now known as the Greenbrier Resort. Moved to Charleston, where he worked at Ramsey Service Station on Rt. 21, where he met my mother, Pansy. He worked for Lewis and Sigman Upholstery, next he began his career in the chemical industry, starting on the chain gang, eventually becoming a chemical operator. “Granny”, as he was known, made Pinto and Navy beans on the steam lines, for which he was well known. He worked for 34 years for Union Carbide – Rhone Poulenc and Dow. “Special Thanks” go to Charles “Chaz” Charley Lynch, cargiver his wonderful help and cooking. Survivors include, son, Gregory A. Campbell and wife, Debbe; grandson, James B. Campbell and wife Sara; great-grandson Benjamin Thomas Campbell (Benny) and several nephews, nieces and friends. Funeral service will be 7 p.m., Sunday, April 7, at Cunningham-Parker-Johnson Funeral Home, with the Rev. Al Mendez officiating. Entombment will be 10 a.m., Monday, April 8, at Tyler Mountain Memory Gardens, with military honors. Visitation with the family will be from 5 to 7 p.m., Sunday at the funeral home. To send flowers or a remembrance gift to the family of Jimmie Ben Campbell, please visit our Tribute Store. "Email Address" would like to share the life celebration of Jimmie Ben Campbell. Click on the "link" to go to share a favorite memory or leave a condolence message for the family.